If you're looking for premium speakers to fill your home theater and handle a variety of musical genres, you can't do much better than the KEF R Series. Transparent. Well-rounded. Superb rendering and imaging at all volume levels. A powerful-yet-compact subwoofer. states High-Def Digest in a May 2016 review of the R400b. Measuring a compact 14 inches deep and wide, the R400b delivers a surprisingly massive low-end with an incredibly quick response. The subwoofer's twin 9 inches bass drivers perform with little excursion, meaning your bass frequencies hit hard and can cease instantly. 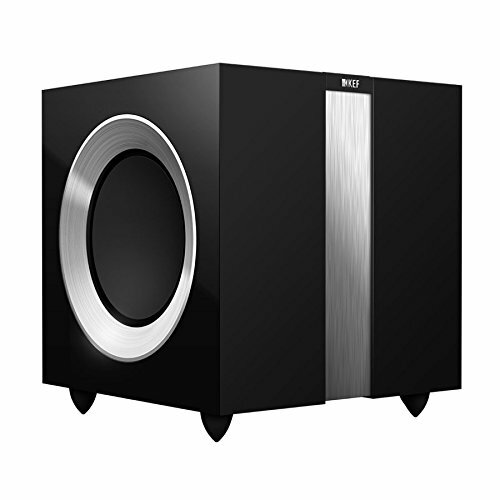 The R400b uses two ultra-low distortion 9 inches bass drivers, each braced with force-cancelling technology within the cabinet to allow both drive units to operate more effectively, giving greater definition to low frequencies. The shape and bracing of the cabinet are computer optimized to minimize secondary radiation from the cabinet walls and distortion from standing waves. Measuring a compact 14 inches deep and wide, the R400b delivers a surprisingly massive low-end with an incredibly quick response.